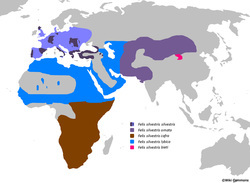 African wildcats (Felis silvestris lybica) are found throughout Africa, except the western rainforests and the true desert areas around the Sahara. They also extend into the Middle East, occupying the coastal areas of the Arabian Peninsula. They inhabit mountains, plains or grasslands, and brush lands. Because they extend over such diverse habitats, they have a wide range of coat coloration, from light sandy colors in the deserts to dark grey and browns in the forested areas. They have very distinct rusty red colored ears and unusually long front legs; they have a loose-limbed gait similar to the cheetah. They also have black feet and a striped, black-tipped tail. In true wildcats, white markings are absent, unlike today's tabby cats. Human encroachment and habitat destruction are driving African wildcats to live in smaller and smaller areas, leading to hybridization (interbreeding with domestic cats) and dilution of their wild genes. This is a serious concern for African wildcats, particularly where wildlife preserves and ranches border with residential areas, which is where they are most likely to encounter outdoor domestic cats. In September 2009, ACR staff traveled to South Africa and met with the Onderstepoort Veterinary School to discuss ways to protect the African wildcat. The Dean of the vet school expressed interest in establishing a mobile vet clinic to provide TNR services to feral cats living on the borders of local game preserves. The school wants to offer its students more off-campus courses and this would be a great project to do so. A mobile clinic would provide vet students a chance to work along side certified veterinarians to spay and neuter feral cats. Not only would feral cats and African wildcats benefit from such work, but so would the future veterinarians of South Africa! UPDATE 2010: Thanks to funding from the Endangered Wildlife Trust, SAN Parks, DWNP Botswana and other foundations, a study on the African wildcat in the southern Kalahari Desert was made possible. The study focused on conservation genetics, behavioral ecology, and sociality and social evolution in the ancestor of the domestic cat. Ms. Herbst is now assisting Dr. Llewellyn Foxcroft, known for his expertise with alien plants, in gathering genetic samples from AWCs living in Kruger National Park. The main objective of this project is to clarify the current genetic status of the African wild cat population in terms of its hybridization with feral domestic cats and to identify focal areas for efficient conservation management strategies. Marna mentions that gathering genetic samples of pet cats in nearby communities would help determine where hybridization is occurring and that genetic testing of AWCs should also be conducted in all national parks in South Africa. In December of 2010, ACR President and Founder, Louise Holton, visited South Africa to see the progress being made to help the African wildcat (and local feral cats). She spent several nights at the Pilanesberg Game Reserve, where AWCs have been seen taking residence. Unfortunately, Louise did not get a glimpse of any wildcats while she was there, but she was greeted by none other than a feral cat. Rangers say feral cats have taken up residence in two camps on the reserve and their populations are growing. This reality only proves that TNR programs are desperately needed to prevent hybridization. The good news is that Louise also visited nearby Sun City (the Las Vegas of South Africa) and met with staff members who have been (along with faculty from the University of Pretoria) TNRing the feral cats who live on the resort’s property. She was thrilled to see that a portion of the resort’s horse stables have been converted into a sterilization clinic and that posters hang throughout the resort to educate visitors on the importance of spay/neuter and properly caring for community cats. After hearing that almost all of the Sun City feral cats have been TNRed, Louise sprung into action, putting the Sun City staff in contact with the managers at Pilanesberg Reserve. Together, Sun City and Pilanesberg Game Reserve are now devising a plan to sterilize the feral cats living on the reserve! 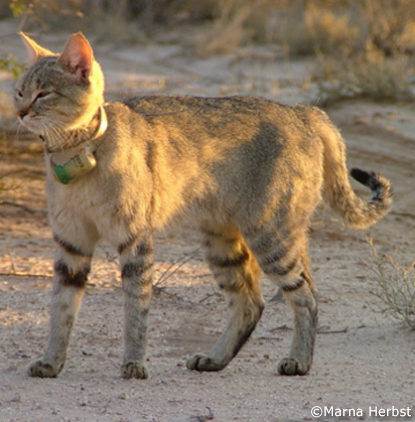 Sterilizing feral cats on game reserves not only protects AWCs from hybridization, it also improves the lives of the feral cats and offers a humane, nonlethal solution for managing their populations. To ensure the feral cats living on Pilanesberg are TNRed and the African wildcats are protected from extinction, Alley Cat Rescue has provided financial assistance towards this project. We know every little bit helps and we will continue to support those who are working to save our cat’s ancestor; There is much more that needs to be done so please, show your support before it’s too late! UPDATE: We are excited to announce the Onderstepoort Veterinary School now has a mobile vet clinic! The clinic is being operated out of the Hans Hoheisen Wildlife Research Station near the Orpen Gate into Kruger National Park. Veterinary students completing their last year (clinical studies) live and study at this research station. Many of the students gain hands-on field experience by working in the mobile clinic. Currently, the mobile clinic is being used to sterilize and treat livestock animals and family pets (most of which are dogs), along the park’s border. However, Alley Cat Rescue is working to include treating cats by using the mobile clinic to operate a TNR program for feral and free-roaming cats. We have begun contacting private game reserves along the western border of KrugerPark to locate where large populations of feral cats may be living, so we can target what areas to start working in. Again, Dr. Marna Herbst and several of her colleagues, including Dr. Llewellyn Foxcroft, have stated that hybridization is more likely to occur on the borders of parks (private reserves), where more human activity takes place. These private reserves are home to countless resorts and lodges for tourists, as well as local farmers. These camps and farms attract feral cats looking for food and shelter, and many staff members take up caring for feral cats who frequent their camps. It is especially important to sterilize these feral cats who are in close proximity to the African wildcats living in the park. We want to protect the AWCs living in the park from hybridization, so their population stays true. As always, funding is needed to keep this project moving, so please consider giving a tax-deductible donation. We need to purchase traps and medical supplies and we will need to cover the cost of transportation and maintaining the mobile clinic. Every little bit helps, so please join us in the fight to save our cats’ ancient ancestor, before it is too late! Show your generosity and support for the African wildcat and our special project in South Africa by making a tax-deductible online donation! 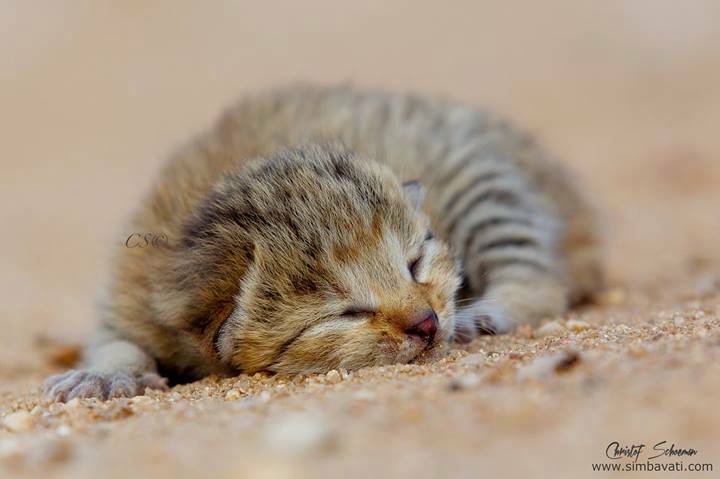 Please remember to note that your donation is for our African wildcat Project, and thank you for your continued support!